An incisive, rollicking, and surprisingly sympathetic look back at one of the National Football League’s most woebegone outfits. Born in 1960 as the Titans in the upstart, made-for-television American Football League (AFL), the New York Jets have, but for a few moments in the sun, been perennial losers—both in the standings and, more important, in their own city, where the New York Giants owned the fans’ hearts and newspaper headlines. 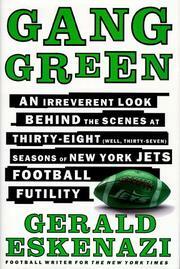 As a New York Times writer on the Jets beat, Eskenazi saw up close the Titans/Jets in all their incarnations: during the early hardscrabble days; in their mid- to late-’60s heyday, when owner Sonny Werblin brilliantly touted the team and the game as an entertainment spectacle and engineered the acquisition of players who would bring the team and the league respectability; during the aimless mediocrity of the ’70s and ’80s; and in the utter futility of the ’90s. It’s not for lack of trying that the Jets have failed, argues Eskenazi, but fail they certainly have—dismally, consistently, almost operatically. After winning Super Bowl III with the personable and talented Joe Namath as quarterback in 1969, the team appeared to have been at the mercy of some unseen power. Excepting a few seasons, most recently in the mid-’80s, they—ve been hamstrung by poor judgment and indifferent management and players, haunted by their own local second-class status and saddled with just plain lousy luck. Hope, however, might be just around the bend as the team has acquired its first marquee talent since Namath, coach Bill Parcells, who guided the Giants to two Super Bowl victories. Like Jimmy Breslin’s New York Mets chronicle or Peter Gent’s thinly fictionalized account of the Dallas Cowboys, this exceptional book should become a staple on every thinking fan’s shelf.